Failed to open a session for the virtual machine “Windows XP”. The virtual machine ‘Windows XP’ has terminated unexpectedly during startup with exit code 1. 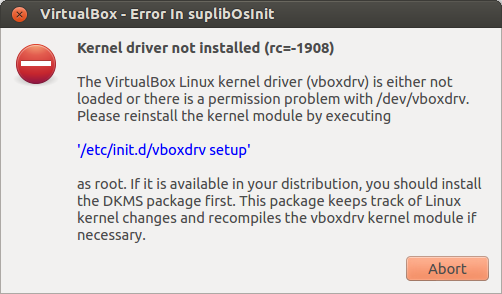 Ubuntu/Debian users might want to install the dkms package to ensure that the VirtualBox host kernel modules (vboxdrv, vboxnetflt and vboxnetadp) are properly updated if the linux kernel version changes during the next apt-get upgrade. # You have heard the man! Error! Your kernel headers for kernel 3.5.0-18-generic cannot be found. There was a time when all you had to do was “Safely Remove” and see the progress bar dance for a few seconds — and you were golden. Those were the days! Anyway it turns out unmount/eject/safely remove are all meant to do different things. Now with Ubuntu 12.10, only “unmount” is available on “Nautilus”! Even “Thunar” is no good. Well people have even reported it [bug]. Please feel free to mark it “The Bug affects You”. What do you mean “why”? Its a BUG. The beauty of opensource is that someone will fix it. Sit back and relax. Its not urgent anyway. Well who would not want to make sure that their Hard Drive is doing well and not in an inconsistent state — unable to do the most important thing that they are supposed to do — SAVE DATA! You wouldn’t want a lossy storage. Anyway, the point is — to make sure that all the data was written to the harddisk before you unplugged it — you’d need to UNMOUNT it. You always should. And if there are more than one partitions on the Hard Drive then you need to unmount each and everyone separately (which was earlier taken care by “SAFELY REMOVE”). Still the Harddisk keeps spinning. You can feel it. You can even hear it. And the LED would just keep glowing. So until they fixed it, we have a work around. Just double click; “Run” and you are almost “GOLDEN” again!